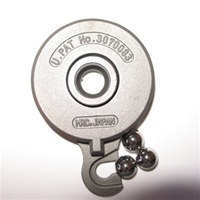 Ball & Ramp clutch release mechanism fits like stock - simple design that produces astonishing results! Ideal for riders that spend long periods on their motorcycles in stop & go traffic! With the MRC Clutch there is no need to install a "lighter" diapharm spring. A lighter spring can cause the clutch to slip if the bike has performance modifications such as a 95 inch kit or cams. No need to purchase a primary cover gasket & primary fluid to replace the diapharm spring. We do recommend that you replace the Clutch Cable when you install this. Thule offers stability and versatility in its high-performance Roadway series of hitch carriers. Constructed of high-strength steel, Roadway hitch racks are available to carry your wheelchair on the trailer hitch. With superior stability and user-friendly features, riders will be comforted to know their chair is safely stowed in the secure Stay-Put cradles. Protect the finish on your chair and your trike by using the included, detachable, anti-sway cages to ensure chair does not foul your vehicle. Retain access to your trunk and tailgate via the Hitch Switch, which tilts down to allow you access to the rear of your trike. When not in use, the two arms fold down with convenient one-touch tilting that doesn’t involve any pins or cords. MADE IN USA! This braking controller can be used to adapt for various disabilities, and requires an Installation Kit comprised of application specific fittings, hoses and fasteners which are about $150.00. Call us, Let's talk about your specific needs. We recommend that this be used as the Front Brake. It is easy to get used to using this with you thumb. The original Front Brake on the Throttle Side now becomes the Rear Brake. Please call us to discuss this and other options we have for You. This braking controller can be used to adapt for various disabilities, and requires an installation kit comprised of application specific fittings, hoses and fasteners: usually about $150 extra. 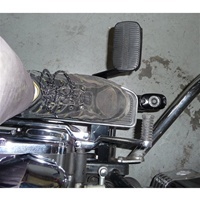 The Right Rear Foot Brake Pedal on stock bike is moved to the left side! buttons usually mounted on the handlebars. It is powered by the bike’s electrical system. Unlike air shifters, no bulky gas bottles to fill. is extremely fast and consistent. System gave him a new-found freedom. from the ease of Kliktronic. and Keith are constantly improving the system. for the right side as well. Just give us a call. and help figure out the perfect set up for You! Call me. My name is Rix. 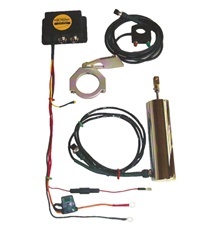 "The Trike Guy"
One option available is the Kliktronic Ignition Interrupt Switch utilizes a Micro Processor with a Quartz Oscillator to insure exact timing each and every full power clutch less up shift. Designed to be compatible with single or multiple coils, carbureted or fuel injected motorcycles for smooth, seamless up shifts under power. LED's are used to give visual confirmation of power and duration of interrupt. An adjustable timer with a range of 0 ms to 500 ms gives a wide range of Interrupt time. An isolator switch allows for easy on/off operation. 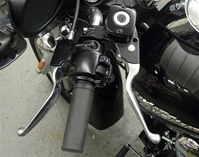 The Kliktronic Ignition Interrupt Switch is designed to be used in tandem with the Kliktronic Electric Shifter. Two years ago, with the increasing number of touring bikes on the road, Baker introduced the F6R: Factory 6 Reverse. This innovation proved to be quite popular and helpful to our customers with late model Harley-Davidsons. But our customers with Factory 5 speeds and Baker DD6's requested an easier, more dependable reverse system for their bikes as well. Well, no longer do you have to wrestle that large bagger out of a tight parking situation. Baker announces the release of the F5R: Factory 5 speed Reverse system. With the F5R, large touring bike riders need not worry about getting stuck somewhere without a buddy to help push them backwards. The F5R can also benefit trikes, bikes with sidecars and trailers! This exciting new innovation from the manufacturers of the Kliktronic Electric Shift System is the perfect solution for motorcycle riders who are unable to use their right foot for rear brake operation. Call us for BASE PRICE for kit plus specific extras to complete your package. We have kits for all Bikes & Trikes. Call us and let us know what your needs are. This dual system is set to revolutionize the world of the disabled rider. 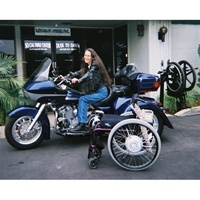 Along with the Kliktronic Electric Shifter, paraplegic riders can ride a trike or outfit with improved confidence and safety.